History hedonist and deviant slacker Filthy Pedro shot to fame when Channel 4’s Transmission show discovered Filthy’s (as he is known to friends) Rock’N’Roll Points psychometric test on his website which he invented to promote his eponymous debut single. He was whisked off to a Channel 4 studio to star in a pop video which introduced the show’s weekly celebrity interview discussing the interviewee’s Rock’N’Roll Points test results. For the last two years Filthy and his band the Carthaginians have been writing and recording an album about hedonism, history and sexual deviancy blending folk, pop, blues and hip hop beats to sound something like early Beck (Mellow Gold/Stereophonic Soul Manure) performing in The Bonzo Dog Do Dah Band (I’m The Urban Spaceman) – it’s edgy, quirky and quintessentially British. Anglesey’s Filthy Pedro (aka Simon Parry) and Tom Mayne (of David Cronenberg’s Wife) set up www.antifolk.co.uk and the 3 monthly Antifolk Festivals (now at the 12 Bar Club, Soho) back in August 2004 which started off as a sparsely attended affair on a Sunday evening to the present day rammed all weekend substance and tonsil abusing ‘love in’ for the secretive music society otherwise known as Antifolk UK drawing musicians and partygoers from all around the world. 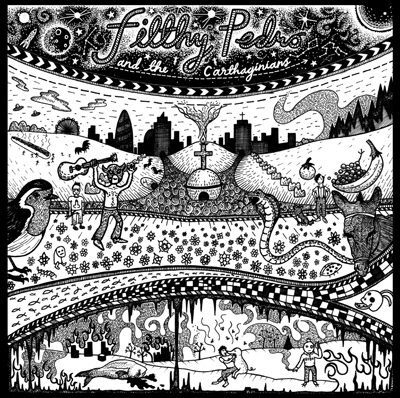 Filthy has toured the UK and the US solo and with his band The Carthaginians and has supported the likes of Jeffrey Lewis, Lach, New York Howl and the Moldy Peaches as well as launching the first single from emerging indie label Blang Records.